On Good Friday, April 19th, a procession will be walking from Stanhope through Netcong. Ahead of the procession, people will be carrying a cross. 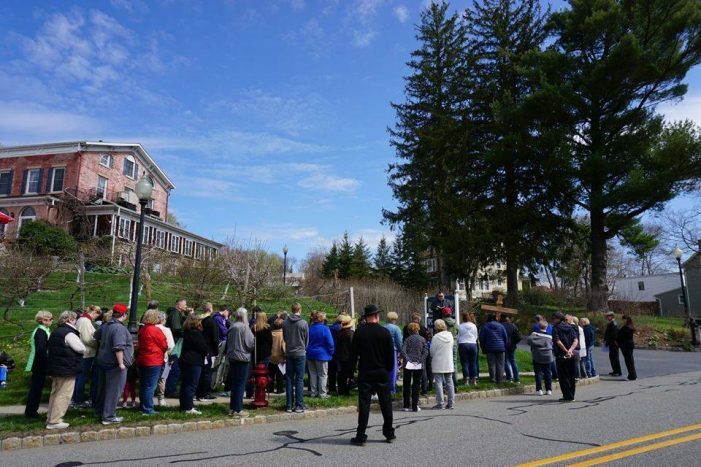 A tradition for over two decades, the Stanhope-Netcong Cross Walk remembers Jesus Christ’s betrayal, sentencing, and death on the cross by telling parts of the story at each of five places during its journey. All are welcomed to join the walk, either walking all or a part of it. The walk takes about an hour and starts at 11a.m. at the First Presbyterian Church, Stanhope located at 100 Main Street, Stanhope. Recently, the pastors involved in the cross walk talked about the tradition. “I do not know or remember when [the cross walk] started, but I believe we have been doing it all 23 years of my time [at First Presbyterian],” said Rev. Hugh Matlack, pastor of the church. At that first stop, and all the others, scripture will be read, a hymn sung, and a prayer given. Two volunteers will be asked to carry a large cross to the next stop. Also, as they exit the Presbyterian church, congregation member, Carol Barry, a bagpiper, will be playing as people move on from that first stop. “Jesus took his walk to Jerusalem and then to the cross for all humanity, not any particular church or institution or individual or national group. I think our ecumenical event represents his intentions for all of us,” said Matlack. The second stop is outdoors, near the entrance to the Bell’s Mansion driveway. There the Rev. Dr. Nick Petrov of the Port Morris United Methodist Church will continue the reading of the events Jesus faced. “The Good Friday Cross Walk grows each year; those who have experienced it come back again and again. I think that our Good Friday crosswalk is very important because it shows to the community a visible church that has a missional and ecumenical vocation. The Good Friday crosswalk indicates that the church in our day is coming together in a new expression of both diversity and unity. At the same time, of course, it is a witness for the love of God,” said Petrov. The pastor noted how the walk brings a variety of people together and how people of different ages and backgrounds take a turn at carrying the cross to its next stop. The third stop is inside the Stanhope United Methodist Church at #2 Route 183 in Netcong. “It’s humbling to know that our community comes together to share a small part of Jesus’s journey on Good Friday. When we arrive at the Stanhope United Methodist Church, and watch the cross slowly come down the aisle to a resting place in front of the darkened altar, you can feel the passion, the heaviness of the day. It’s truly inspirational to feel the presence of the community as we share this moment in time together,” said Lynn Zaremba, pastor of the church. The fourth stop is the Netcong Train Station on Main Street, where once again people are outside as they hear the story of Jesus’ last day on Earth. The speaker for that spot will be a Certified Lay servant from the Port Morris United Methodist Church. From there, the procession will go into its final stop: St. Michael’s Roman Catholic Church at 4 Church Street in Netcong. There they will hear the scripture, sing, and have a final prayer. For more information on the cross walk, call Stanhope United Methodist Church at 973-347-0247.